At the recent DEMO Enterprise 2014 conference, Zementis announced its participation in the SAP® Startup Focus program and launched ADAPA for SAP HANA, a standards-based predictive analytics scoring engine. ADAPA for SAP HANA provides a simple plug-and-play platform to deploy the most complex predictive models and execute them in real-time, even in the context of Big Data. In joining the SAP HANA Startup Focus program, Zementis set out to address two key challenges related to the operational deployment of predictive analytics: Agile deployment and scalable execution. Transactional data has for years pushed the boundaries of predictive analytics. The financial industry, for example, has been using transactional data to detect fraud and abuse for decades with complex custom solutions. Real-time scoring is paramount for companies to be able to predict and prevent fraudulent activity before it actually happens. Likewise, the Internet of Things (IoT) demands effective processing of sensor data to employ predictive maintenance for detecting issues before they turn into device failures. To solve these challenges, Zementis combined its ADAPA predictive analytics scoring engine with SAP HANA in a true plug-and-play platform which is universally applicable across all industries. 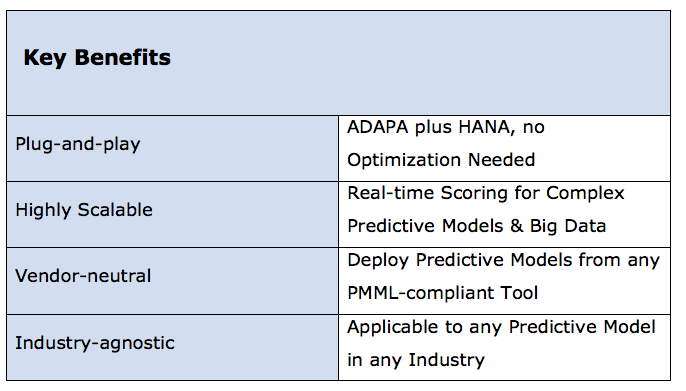 ADAPA to serve scoring requests and execute predictive models, HANA to offload complex model preprocessing and computation of aggregates. In this scenario, real-time execution critically depends on HANA serving complex data lookups and aggregate profile computation in a few milliseconds. In a high-volume environment, such aggregates or lookups may have to be computed over millions of transactions. ADAPA provides scalable real-time scoring of the core model, plus agility for model deployment through the Predictive Model Markup Language (PMML) industry standard. Clients are able to instantly deploy existing predictive models from various data mining tools. 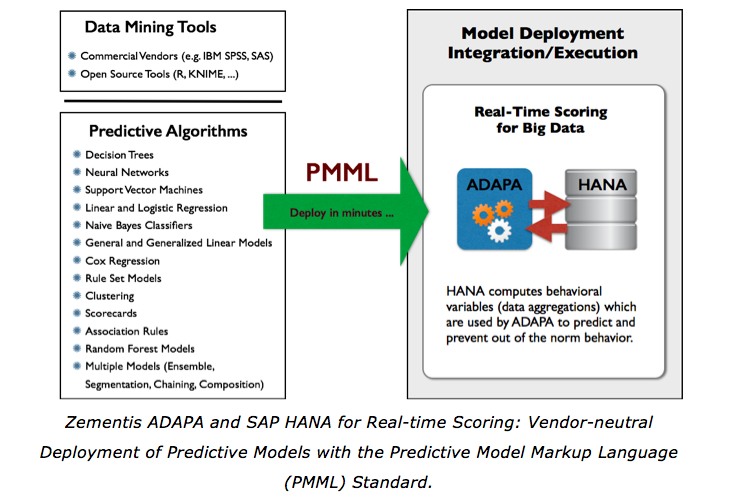 For example, you can take a complex predictive model from SAS Enterprise Miner, export it in PMML format and simply make it available for real-time scoring in ADAPA for SAP HANA. The same process, of course, applies to most commercial tools, e.g. SAP Predictive Analysis, KXEN, IBM SPSS, as well as open source tools like R and KNIME. The unique aspect of the Zementis / SAP platform is that it combines the benefits of an open standard for predictive analytics with the power of in-memory computing.